Once upon a time, Hazel and Jack were best friends. They had been best friends since they were six, spending hot Minneapolis summers and cold Minneapolis winters together, dreaming of Hogwarts and Oz, superheroes and baseball. Now that they were eleven, it was weird for a boy and a girl to be best friends. But they couldn’t help it – Hazel and Jack fit, in that way you only read about in books. And they didn’t fit anywhere else. Why did I read this book: Earlier this year I read and reviewed Juniper Berry by M.P. Kozlowski, another middle grade novel from Walden Pond Press…and I loved it. When I read the synopsis for Breadcrumbs, coupled with the gorgeous art AND the fact that it was from the same publisher, I was a complete goner. There once was a young girl named Hazel who loved dueling pirates and robots, superhero baseball, and daring adventures to strange new worlds. Together, Hazel and her best friend Jack have traveled to Narnia, defied the Magisterium, and been the heroes of Hogwarts, using their limitless imaginations to explore impossible kingdoms and thwart formidable enemies. In the words of the sage Forrest Gump, Hazel and Jack were like peas and carrots, and nothing could ever separate them. But one day, Jack changes. He gets something in his eye, and seemingly overnight, Jack begins to act like a different person. Suddenly, he does not want to play with Hazel and her babyish games anymore. Heartbroken, Hazel cannot begin to understand what could have made her best friend change so dramatically, so quickly – but everyone, including her mother, tells her that it is “normal” and part of “growing up”. Then, following his personality change, Jack disappears. His mother distractedly tells Hazel that he’s gone to help out his elderly aunt Bernice – an aunt whom Hazel has never, ever heard of before. Things seem even worse when Jack’s other friend, Taylor, comes by to tell Hazel that he saw Jack in the woods following an impossibly tall, thin woman all in white. No one else seems to care that Jack has gone missing, and Hazel knows in her heart that something is not right with her best friend. And so, with a compass, a treasured baseball, and a backpack of odds and ends, Hazel bravely heads into the woods to defy the Snow Queen and to save her dearest friend. You know how there are some misguided people out there that say that young adult and middle grade books are written solely for children, and therefore can’t possibly achieve the same levels of nuance and poignancy that adult books do? To those jaded souls I say: read Breadcrumbs. This novel from Anne Ursu and illustrated by Erin McGuire is a thing of beauty in both art and story, drawing not only from the fables of Hans Christian Andersen (including the Snow Queen, the red dancing shoes, and the little matchgirl, amongst others), but also the contemporary works that have captured imaginations – including Philip Pullman, J.K. Rowling and Stan Lee. Ms. Ursu manages to pull from those influences and create a unique, utterly memorable work of art of her own. In other words, I loved Breadcrumbs. The most wonderful thing about this novel, in my opinion, is the blurred line it walks between fantasy and reality. When Jack stops talking to Hazel, it could very well be because he has a magical shard of an ancient, cruel mirror caught in his eye that has frozen his heart – but at the same time, it could simply be a metaphor for growing up and apart. Even the best of friends change as they get older; some leave “childish things” like imaginary fortresses and daring adventures to made-up places behind, while others let their imaginations run as long as they can. In this sense, I felt that Hazel’s story holds such a powerful meaning because it could be construed as a dream, or some kind of alternate vision of those childhood friendships that drift apart with age. I personally prefer Ms. Ursu’s imaginative quest metaphor; in the beauty of hope and love that prevails to bring back those closest to you, even if they push you away. 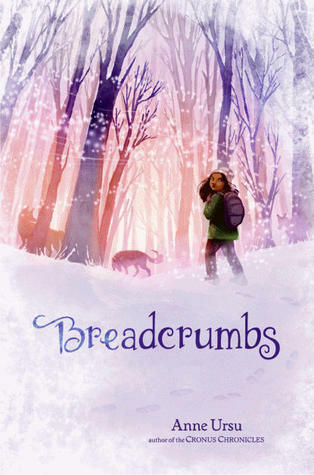 Breadcrumbs is a beautiful fable that follows young Hazel on an impossible journey not only to save her best friend, but to discover her own sense of worth. So many times on her journey, Hazel questions herself – because, as a perpetual outsider, Jack is the only person that has ever made Hazel fit (or so she thinks). With her parents recently divorced, her father has a new life with a new family and no time for Hazel or her mother, and Hazel herself feels alone and awkward in a school that does not appreciate her scope for imagination. Furthermore, as an adopted child from India, Hazel feels even more estranged from her classmates. I once read a piece by Neil Gaiman in which he elucidated that children’s fiction is cruel and often horrific in the extreme, and for novels like Breadcrumbs (and Gaiman’s Coraline or The Graveyard Book, for example) this is an undeniable truth. Adults are sadistically tough on their young protagonists, forcing them to lose their families and suffer all kinds of grave injury, all in the name of a true hero’s journey. On Hazel’s journey through an enchanted wood, she picks up the pieces of herself, which is a beautiful thing (if achieved by cruel means). I dearly loved her character and felt for her on every step of her frosty, frightful journey. And I haven’t really said much of the allusions to various myths and notable childhood fantasy works! Rest assured they are there, and they are wonderfully wrought. Though Hans Christian Andersen’s fables are at the heart of the journey, there are countless other allusions throughout. The only thing that felt a little off to me in the whole novel was the level of Hazel’s literary prowess and how some of her thought processes felt a little older than her fifth-grade age. That said, the narrative voice of the novel is otherwise flawless. I absolutely loved this heartbreaking gem of a novel, and recommend Breadcrumbs to readers of all ages. Yet another notable read of the year – and quite possibly the best contemporary middle grade novel I have read, period. In the real world Hazel was an ordinary thing, a misshapen piece with no purpose. Maybe here she could be a swan. Maybe it had been left here, just for her. She could fly over the woods to rescue Jack. She could bear him on her back on the way home. She would alight just before the edge of the wood and unfurl herself. And then maybe she would hide the skin there, deep in the hollow of a tree, for when she needed to spread enormous white wings. She held it up. The neck and head hung to the side, and Hazel tried to ignore the way her stomach turned looking at it. After all, she was not the one who’d killed the creature. She felt naked as she began to wrap it around herself, like a bird plucked of its feathers—all goosebumpy skin and trembling bones and frail, sputtering heart. And then the skin was around her and Hazel was softness, she was warmth. The skin settled into her as if made for her. But she was no swan. She had legs, she had arms, she had a swan neck dangling uselessly behind her. Of course it would never work, not on her. She didn’t even know her name. Hazel walked over to the edge of the ridge, thinking she might catch a glance of her reflection in the stream below. But it was too far away, and moving too quickly. It didn’t matter. Hazel knew what she looked like. The skin was just a taunt, just one more thing she would never have. And she was still alone. She tore the skin off and hurled it into the ravine. Hazel watched as the beautiful, terrible thing fell into the water. It could not fly, it could not float, because all its swan-ness had been taken away. She stared down at the ravine, and then turned and walked slowly back to her backpack. And a hand grabbed her arm. “Where is it?” a voice hissed in her ear. Additional Thoughts: Make sure to check out our guest post from author Anne Ursu on the official Breadcrumbs blog tour to learn more about her inspirations and influences, and for a chance to win a copy of Breadcrumbs! I’m reading Breadcrumbs now and love all the literary references, especially when Snow Queen takes Jack and asks if he wants a Turkish Delight, I totally LOLed at that. Also, I think that maybe Hazel thinks differently from a regular fifth grader because she’s precocious and bookish and lonely and seems like she’s had to grow up a little faster because of the divorce and all. Oh, this story looks beautiful. Funnily enough, the Snow Queen was always my favourite fairy tale. This looks excellent. Thanks so much for the review, and for introducing me to this one! The Little Mermaid is my favorite. While I discovered the Disney version first, the original is just haunting and beautiful. I really enjoy this cover. I will have to look into the book. Oooh, this looks really good. I also really love that cover! I’ve always loved Puss In Boots. Not sure that’s exactly a fairy tale, but I figure it’s close enough. The cover for this one caught my eye a while back,a nd your review makes me want it! Sounds very good. I enjoyed this modern retelling of The Snow Queen very much, however, the ending was upsetting. I know from The Snow Queen what needed to happen for Jack to be healed. Although he was rescued, Jack was not healed and he returned weakened to an overwhelmingly sad situation. what does jack look like? Also ca u send it back as soon as possible? I have have a project about 1 of u’r books…….